to keep your smile looking its best. We value clear and simple communication, the best of modern technologies, and a friendly and comfortable atmosphere. We have a long history of serving people well. See what others are saying about their experience at Bucher Family Dentistry. Located near 127th and Murlen in Olathe, our office is easy to find and convenient to access. Call (913) 764-5114 to schedule your appointment today. We are looking forward to meeting you! "Dr. Bucher has always carried on an honest open evaluation of my dental health. His recommendations and services have always been as if I was talking to a friend who has expert advice on a subject that I need and they don't stand to gain anything personally from sharing it with me. I always appreciate going to his friendly practice." "This is my new favorite dentist... They are all very professional, gentle, attentive to the patient's needs, and extremely knowledgeable in their field." "Ryan has been our family dentist for several years now and I can't say enough about the quality of care he provides. I highly recommend Bucher Family Dentistry." 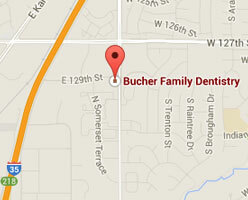 "Bucher Family Dental has such an incredibly friendly staff! Their hygienists and Dr. Ryan Bucher provide very thorough dental cleaning and exams. I am always impressed by their professionalism and expertise."